"A Mexican restaurant I used to go served this dish. I came up with what I think is their recipe or close to it. It's awesome and a different take on traditional chicken salad. Can be served with crackers, tortilla chips, or on bread as a sandwich." 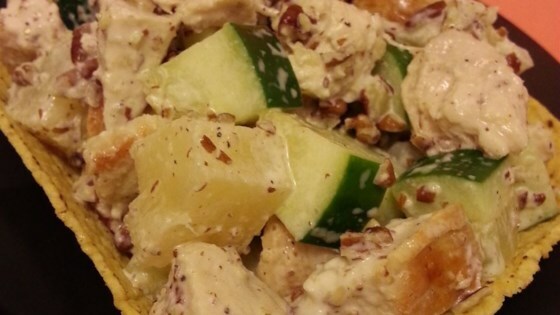 Mix chicken, pineapple chunks, walnuts, cucumber, mayonnaise, salt, and black pepper in a bowl. Serve in taco bowls. Discover the secret ingredient that gives this chicken salad a sweet lift. I really hated this recipe. The mix of pineapple and mayo was a bad combination. This was a good chicken salad- i added one jalapeno pepper finely chopped and a half lime juiced It made it a bit more "mexican"